MILLION DOLLAR QUARTET, Broadway’s new hit musical, is pleased to announce that Wanda Jackson, the “Queen of Rockabilly,” will join the cast of the Tony nominated Best Musical for a special performance during the finale of the Thursday evening, January 20 performance at the Nederlander Theatre (208 West 41st Street). Jackson, a 2009 Rock and Roll Hall of Fame inductee, first gained national attention with her 1958 recording of “Let’s Have a Party,” a tune she made into a hit of her own even after one-time boyfriend Elvis Presley had released a version of it. She’s been a pioneer in rockabilly, rock and roll, country, and gospel music. Her latest album, The Party Ain’t Over, which she recorded with guitarist-vocalist-White Stripes founder Jack White, will be released January 25 on Third Man/Nonesuch Records. The cast of MILLION DOLLAR QUARTET features Eddie Clendening (Elvis Presley), Lance Guest (Johnny Cash), Tony Award® winner Levi Kreis (Jerry Lee Lewis), Jared Mason (Carl Perkins), James Moye (Sam Phillips), and Elizabeth Stanley (Dyanne). In addition, to Kreis’ Tony® for Best Featured Actor in a Musical, MILLION DOLLAR QUARTET received Tony nominations for Best Musical and Best Book of a Musical (Colin Escott & Floyd Mutrux). The show received an Outer Critics Circle Award for Outstanding Featured Actor in a Musical (Levi Kreis), a Drama Desk Nomination for Outstanding Musical Revue and three Drama League Nominations including Distinguished Production of a Musical and Distinguished Performance (Lance Guest & Levi Kreis). MILLION DOLLAR QUARTET is directed by Eric Schaeffer and features a book by Colin Escott and Floyd Mutrux. The design team for Broadway includes: Derek McLane (scenic design), Howell Binkley (lighting design), Jane Greenwood (costume design), Kai Harada (sound design) and Chuck Mead (musical arrangements and supervision). MILLION DOLLAR QUARTET is produced by Relevant Theatricals, John Cossette Productions, American Pop Anthology, Broadway Across America, and James L. Nederlander. The Chicago production of MILLION DOLLAR QUARTET opened in 2008 and is still playing to packed houses at the Apollo Theatre. An upcoming national tour will launch next season and a London production will open at the Noël Coward Theatre on February 28, 2011 with previews beginning February 8, 2011. For more information about MILLION DOLLAR QUARTET, visit www.MillionDollarQuartetLive.com. Follow MILLION DOLLAR QUARTET news on Twitter @milliondquartet and on Facebook. Tickets for MILLION DOLLAR QUARTET are available online www.TicketMaster.com, by calling 877-250-2929, or by visiting the Nederlander Box Office (208 West 41st Street). MILLION DOLLAR QUARTET’s performance schedule is Tuesday at 7PM, Wednesday through Saturday at 8PM. Matinees on Wednesday and Saturday at 2PM and Sunday at 3PM. NEW REGULAR PERFORMANCE SCHEDULE (BEGINNING MONDAY, JANUARY 3) is Tuesday and Wednesday at 7 PM, Thursday through Saturday at 8 PM. Matinees Wednesday and Saturday at 2:30 PM and Sunday at 3 PM. When WANDA JACKSON, the justly crowned Queen of Rockabilly, recorded “Let’s Have a Party,” a tune she made into a hit of her own in 1958 even after one-time boyfriend Elvis Presley had released a version of it, her delivery of the chorus wasn’t so much a suggestion as a command. As the title – and, more importantly, the contents — of her latest album, The Party Ain’t Over, indicates, this feisty septuagenarian artist is as galvanizing as ever. Jackson was recently inducted into the Rock and Roll Hall of Fame, honored with a long-time-coming, Early Influence accolade for her pivotal role in the evolution of popular music, especially where female artists were concerned. As a teenager in the mid-50s, the diminutive Jackson was the first woman to perform unadulterated rock and roll – and she one-upped the boys defining this new genre, Presley included, with her exhilaratingly forthright approach. The young Jackson, an Oklahoma native, came across as both gritty and glamorous; a playfully suggestive growl to her voice matched the daring, handmade outfits she wore, short skirts and fringed dresses that have inspired would-be bad girls for decades to come. A tireless touring artist for more than 50 years, Jackson continues to win over new, young fans, including guitarist-vocalist-White Stripes founder Jack White. On this debut for Third Man/Nonesuch Records, produced and arranged by White at his Nashville studio, the spirited Jackson proves that brash rock and roll attitude need not have an age limit. Her trademark growl remains intact on rockers like “Rip It Up” and “Nervous Breakdown;” she opens the set with an echo-laden sneer on a rollicking version of “Shakin’ All Over” and ends it ten songs later with a plaintive take on Jimmie Rodgers’ “Yodel #6,” along the way gamely tackling country, gospel, densely worded Bob Dylan, and a little bit of Tin Pan Alley. Jackson and White are a remarkably simpatico pairing; their collaboration came together quickly, serendipitously. One of Jackson’s colleagues had originally approached White about doing a duet with Jackson for a proposed “Wanda and Friends” disc, but White demurred. Instead, he offered something better, inviting Jackson to cut a single with him for his Third Man label, and that swiftly led this kindred spirits to put together an entire album. White himself backs Jackson on lead guitar, cutting loose with solos that are as ferocious and fun as Jackson’s vocals; in fact, the entire band that White assembled – including pedal steel, a horn section and backing vocals from singers Ashley Monroe and Karen Elson –is similarly uninhibited, matching Jackson’s and White’s intensity and, just as often, their humor. Though the work is carefully arranged, the resulting tracks feel like one unforgettable after-hours session, with everyone in thrall to the woman at the heart of these tunes. The first song White suggested they cut was “Rip It Up,” one Jackson knows very well from her rockabilly days. As she explains, “It shocked me that he wanted me to do that but that was the first one I recorded. He loves that song and I do too. But I think he did that to put me at ease, let me do something that I’m real familiar with and real comfortable with, and he didn’t have to direct me or any of that. I just reared back and sang it. That got me loosened up and made me comfortable.” Not that White simply wanted to make things easy. On the sultry “You Know I’m No Good,” says Jackson, “We’d get through one take and he’d say, ‘Oh Wanda that was great.’ And I said, ‘Whew, I made it.’ Then he said, ‘Now let’s do one more and let’s push a little more.’ I was getting physically kind of tired and probably kind of got angry but he got the take he wanted. It’s funny how you can come up with what your producers want in the strangest ways.” A little bit of their repartee can be detected at the top of the track, just as the analog tape gets rolling. The Party Ain’t Over is about stepping out, not summing up, but it does touch on important aspects of Jackson’s life and ever-evolving career. “Teach Me Tonight,” a country-inflected interpretation of the DeCastro Sisters’ hit, partly fulfills Jackson’s desire to cut a 40s-style big-band disc. “Like A Baby,” recorded live in the studio with the whole band, allowed Jackson to revive an obscure, bluesy number from her old buddy Elvis. The Jimmie Rodgers tune is the first song she ever learned as a child; her father taught her the chords on the guitar, she figured out how to sing along while she played, and, like any aspiring vocal star of the era, she taught herself how to yodel, a skill she has clearly maintained over the ensuing decades. And, as she notes, the party ain’t over. Follow BBB on Twitter: @BBBway and on Facebook. MILLION DOLLAR QUARTET, the new West End musical that tells the electrifying story of the night in 1956 when Elvis Presley, Johnny Cash, Carl Perkins and Jerry Lee Lewis came together to make music and ended up making history, will star Ben Goddard (Jerry Lee Lewis), Derek Hagen (Johnny Cash), Francesca Jackson (Dyanne), Robert Britton Lyons (Carl Perkins) and Michael Malarkey (Elvis Presley), joining the previously announced Bill Ward (Sam Phillips). To watch Levi Kreis, Robert Britton Lyons and Corey Kaiser give “LX NY” a tour of the hit musical. MILLION DOLLAR QUARTET, the hit Broadway musical, will welcome James Moye (Ragtime, Happiness) to the role of ‘Sam Phillips’ starting tonight at the Nederlander Theatre (208 West 41st Street). Moye will temporarily be taking over the role for Hunter Foster who will be on a leave of absence from the show. James Moye (Sam Phillips). Broadway/Off-Broadway: Ragtime (revival), A Tale of Two Cities, The Full Monty, Urinetown, Happiness (LCT). Tours: Drowsy Chaperone (Aldopho), Little Shop of Horrors (Orin), White Christmas (Bob Wallace, Ordway). Regional credits include: Tinyard Hill (Theatreworks-CA, 2009 SF Bay Critics Award, Best Supporting Actor), 110 In the Shade (Signature-VA, Helen Hayes nominee-Best Supporting Actor), Steppenwolf, Goodman, Old Globe. Film/TV: Fair Game, “Royal Pains,” “Law and Order: CI,” “As The World Turns,” “Guiding Light.” Cast recording: Dream True. Proud Member-AEA. www.JamesMoye.com. 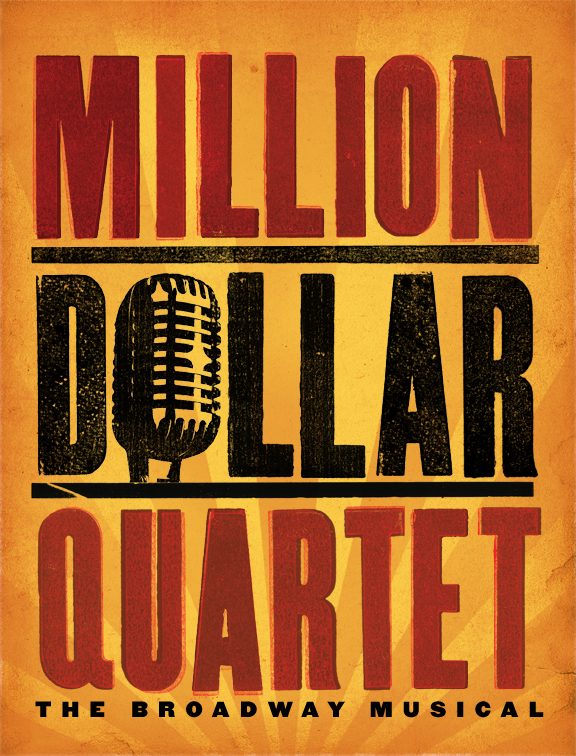 MILLION DOLLAR QUARTET, the hit Broadway musical, will welcome Lee Rocker, bassist and vocalist for the Grammy nominated band The Stray Cats, to the cast for a limited time only. Rocker will make his Broadway debut in the role of ‘Jay Perkins’ at the Nederlander Theatre (208 West 41st Street) for 12 performances only (January 21 – 31). Rocker made his mark singing, playing, standing on, spinning and rocking his giant upright bass in the legendary music group The Stray Cats. Grammy-nominated, The Stray Cats have sold nearly 10 million albums and garnered an astounding 23 gold and platinum certified records worldwide. Founded by Rocker, Brian Setzer, and Slim Jim Phantom, The Stray Cats remain a radio staple, were music video pioneers at the infancy of MTV, and repeatedly brought rockabilly to the top of the charts. Rocker will temporarily join the cast of MILLION DOLLAR QUARTET while Corey Kaiser, who originated the role of ‘Jay Perkins’ on Broadway, takes a previously scheduled vacation. Kaiser will return to the production Tuesday, February 1. CLICK THE LINKS to see footage of Darlene Love perform “He’s A Rebel” and “White Christmas” with the cast of MILLION DOLLAR QUARTET, the Broadway musical sensation. Yesterday evening, Love took the stage of the Nederlander Theatre to join the cast of MILLION DOLLAR QUARTET in the special encore. Love has been hailed as one of the greatest singers in pop music starting with her first number one recording, “He’s A Rebel,” through her string of label hits with legendary producer Phil Spector, including “Da Doo Ron Ron,” “He’s Sure The Boy I’m Gonna Marry,” and “Christmas Baby Please Come Home.” Love was recently nominated for the third time to the Rock and Roll Hall of Fame. On Saturday, New York City Mayor Michael R. Bloomberg declared December 4, 2010 “MILLION DOLLAR QUARTET Day” in honor of the 54th anniversary of the real life jam session which brought together Elvis Presley, Johnny Cash, Jerry Lee Lewis, and Carl Perkins together a legendary jam session. The mayoral proclamation was read from the stage of the Nederlander Theatre (208 West 41st Street) by Katherine Oliver, the commissioner of the New York City Mayor’s Office of Media and Entertainment. Tonight’s special celebratory performance is a testament to the continuing relevance and vitality of Elvis Presley, Johnny Cash, Jerry Lee Lewis, and Carl Perkins, and the overwhelming impact they had on the music community over the course of their careers. Today, I join with all New Yorkers in giving MILLION DOLLAR QUARTET a standing ovation.